When Canadian company Alimentation Couche-Tard acquired Statoil Fuel & Retail (now Circle K), the petroleum group had a different app for each of the eight European countries it operates in. Being fully customer-centric, mobile communication is of top priority for Circle K. EGGS was therefore commissioned to help simplify Circle K's digital ecosystem - developing a comprehensive technological platform that merged all eight apps into one. 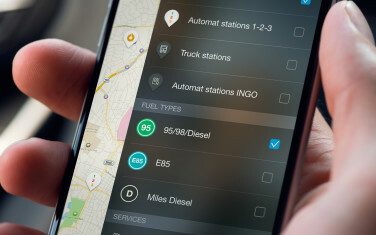 The new app provides practical functions such as a driver’s log, overview and maps of petrol stations - including their services. In addition to that is Extra Club, which is Circle K’s loyalty program. Circle K is on a continual quest to enhance customer loyalty by creating relevant and attractive services, along with special offers that are specifically tailored to all its customers needs. Our EGGS technologists have helped develop a future-proof app that’s a convenient tool for the one million car owners and commercial vehicle operators who use Circle K’s 2000+ petrol stations throughout Europe each day. A recurring question that crops up in mobile app projects is “What platforms do we support? Should we go fully native or opt for a hybrid approach?” Whilst there’s generally no one-size-fits-all answer, at EGGS we believe that creating a fantastic user experience is what matters most. So we decided to design and develop native apps for both Android and iOS. This allowed for highly tailored experiences that optimally built on platform strengths, interaction guidelines and usage patterns. Through a creative process based on comprehensive user insight - where we focused on constant interaction between developers and designers - we managed to create platform specific solutions that meet genuine user needs. EGGS' designers and developers have worked as a lean, close-knit team with Circle K’s own developers. By applying the scrum method development on the new app and corresponding backend platform, the entire process has been seamless and extremely efficient. Within such a large organisation such as Circle K, this has proven to be a successful way of accomplishing an innovation project of this scale.